↑ D'Imperio, Chuck (February 8, 2019). "Baseball Hall of Fame Remembers One of the Greats: Frank Robinson". CNY News. 1 2 Goldstein, Richard (February 7, 2019). "Frank Robinson, Hall of Fame Slugger and First Black Baseball Manager, Dies at 83". The New York Times. 1 2 Fay, John (February 7, 2019). 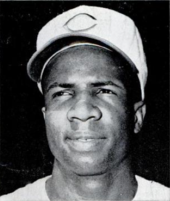 "Frank Robinson, first African-American star for Cincinnati Reds, dead at 83". Cincinnati Enquirer. 1 2 3 4 5 6 7 8 9 10 "Frank Robinson - Society for American Baseball Research". sabr.org. Retrieved February 7, 2019. ↑ "Who's Better At Hoops: Bill Russell Or Frank Robinson?". The Baltimore Sun. December 12, 1990. Retrieved February 7, 2019. ↑ Sharnik, Morton. "THE MOODY TIGER OF THE REDS". Vault. Retrieved February 7, 2019. ↑ Landers, Charles. "Frank Robinson once took a Luis Tiant fastball 541 feet straight out of Memorial Stadium". MLB. Retrieved May 8, 2017. ↑ "1966 World Series - Baltimore Orioles over Los Angeles Dodgers (4-0)". Baseball-Reference.com. January 1, 1970. Retrieved February 7, 2019. ↑ "June 26, 1970: Frank Robinson's back-to-back grand slams - Society for American Baseball Research". sabr.org. Retrieved February 7, 2019. ↑ "Ultimate Mets Database - Memories of Rod Gaspar". Ultimatemets.com. Retrieved February 7, 2019. ↑ "Rome News-Tribune - Google News Archive Search". news.google.com. Retrieved February 7, 2019. ↑ JOSEPH DURSO (November 29, 1972). "Angels Get Dodgers' Frank Robinson - The New York Times". Nytimes.com. Retrieved February 7, 2019. 1 2 "Frank Robinson Stats". Baseball-Reference.com. Retrieved February 7, 2019. 1 2 Special to The Plain Dealer (May 25, 2017). "Frank Robinson's debut as Cleveland Indians player-manager was historic (photos, audio)". cleveland.com. Retrieved February 7, 2019. ↑ "Reds All-Time Leaders | Cincinnati Reds". Cincinnati.reds.mlb.com. May 24, 2018. Retrieved February 7, 2019. 1 2 Van, Bill. "Frank Robinson, former SF Giants manager and baseball trailblazer, dies". SFChronicle.com. Retrieved February 7, 2019. 1 2 3 "ESPN Classic - Robinson set records and broke barriers". Espn.go.com. Retrieved February 7, 2019. ↑ Mike Klingaman; Childs Walker (February 7, 2019). "Baltimore Orioles Hall of Famer Frank Robinson dies at 83". The Baltimore Sun. ↑ MURRAY CHASS (February 13, 2002). "BASEBALL; Minaya, Robinson, Tavares Will Now Run the Expos - The New York Times". Nytimes.com. Retrieved February 7, 2019. ↑ "ESPN Classic - Robinson set records and broke barriers". Espn.com. Retrieved February 7, 2019. ↑ "SI.com – SI Players Poll – Aug 22, 2006". CNN. August 22, 2006. Retrieved May 2, 2010. ↑ "Johnson, Nats give Robinson 1000th win". Archived from the original on September 29, 2007. Retrieved December 4, 2018. ↑ Mark Zuckerman (May 26, 2006). "Robinson tearful after win". The Washington Times. Retrieved May 29, 2006. ↑ Svrluga, Barry (January 11, 2007). "Nats Will Not Offer Robinson a Paid Job". The Washington Post. ↑ Sheinin, Dave (October 2, 2006). "Nats' Robinson Bids a Fond Farewell". The Washington Post. 1 2 "Frank Robinson". Baseball Reference. Sports Reference LLC. Retrieved August 11, 2016. ↑ "Frank Robinson". Hickok Belt. August 31, 1935. Retrieved February 7, 2019. ↑ "Frank Robinson". Baseball Hall of Fame. Retrieved November 15, 2018. 1 2 Justice, Richard. "Frank Robinson dies | Baltimore Orioles". Mlb.com. Retrieved February 7, 2019. ↑ "100 Greatest Baseball Players by The Sporting News : A Legendary List by Baseball Almanac". www.baseball-almanac.com. Retrieved February 7, 2019. ↑ Sandomir, Richard (October 31, 1999). "TV SPORTS; All-Century Became All About Rose and Gray". Retrieved February 7, 2019 – via NYTimes.com. ↑ Seidel, Jeff. "O's pay tribute to Robinson at Camden Yards". Retrieved July 15, 2012. ↑ "Cleveland Indians to unveil statues honoring Robinson and Boudreau – Cleveland.com (Cleveland Plain Dealer)". Cleveland.com. January 24, 2017. Retrieved February 7, 2019. ↑ "President Offers Tributes to Medal of Freedom Honorees". The New York Times. Associated Pres. November 10, 2005. Retrieved February 7, 2019. 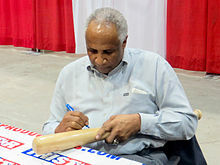 ↑ "Fredericksburg.com – Frank Robinson in town for honor". Archive.today. July 9, 2012. Retrieved February 7, 2019. ↑ "ESPN.com - Most memorable opening day moments". Sports.espn.go.com. March 31, 2003. Retrieved February 7, 2019. ↑ "Tigers' Miguel Cabrera wins AL MVP over Angels' Mike Trout". The Washington Post. November 15, 2012. Retrieved February 7, 2019. 1 2 Bamberger, Michael. "HOME AGAIN FRANK ROBINSON IS BACK WHERE HE BELONGS: IN THE GAME". Vault. Retrieved February 7, 2019. ↑ "ESPN Hires Frank Robinson As an Analyst". The Washington Post. Retrieved May 2, 2010. ↑ Svrluga, Barry (February 16, 2007). "Robinson Declines Celebration in His Honor". The Washington Post. Retrieved May 2, 2010. ↑ foxsports (February 2, 2015). "Hall of Famer Robinson to become senior adviser to MLB commish". Foxsports.com. Retrieved February 7, 2019. ↑ Waldman, Tyler. "Frank Robinson, Baseball Lifer And Orioles Legend, Has Died". WBAL.com. WBAL. Retrieved February 7, 2019.